In many ways, America joined the modern world just a century ago this September when it took part in one of the minor wars in its history. True, no war is minor because so many lives can be lost and so many people can be displaced. Yet the Spanish-American War, because of its brevity and the nature of the hostilities, comes closest to such a definition. In magnitude, it was nothing like the bloody confrontations of the Civil War or the world wars or the wars this century in Korea and Vietnam. After the outbreak of the Spanish-American War, America, as it was known by Anglo-Saxon Protestant farmers, would never to be the same again. The ensuing years made America the world’s melting pot in the eyes of some. To others, it became the planet’s largest collection of hyphenated communities. Following Spain’s defeat by Uncle Sam, the United States was thrust upon the world stage as a major player. Within a few months of the start of the conflict the United States suddenly acquired the tottering 400-year-old empire of Imperial Spain. It thereby became the political landlord of the Philippines, Guam, Cuba, Puerto Rico and several other dependencies. The United States from then on was a colonial administrator in the Caribbean and Far East, just as England, France and Germany were in Asia, and the many islands in the seas. 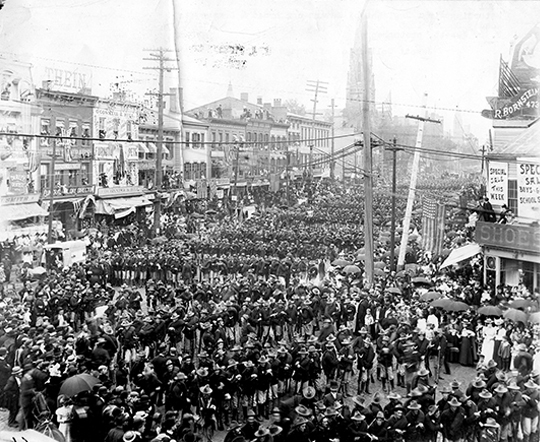 On the eve of the Spanish-American War in 1898, Newark’s population was 250,000, about the same as today. Yet the city was substantially smaller. Huge pieces of real estate along the Elizabeth border to the south and the Township of Vailsburg to the west had not yet been annexed. At this time, Newark was just 10 square miles. Today, it encompasses 23.4 square miles. To the city’s credit, industries were booming and Newark’s commercial leadership throughout the state was unchallenged. Its 10 insurance companies were among the nation’s largest. Prudential, Mutual Benefit, and the Fireman’s were known all over the country. Also very profitable were smaller companies that catered to special communities: Masonic Mutual, New Jersey Plate Glass and the Odd Fellows’ Mutual. In the world of finance, National Newark Banking Co., the National State Bank of Newark and Manufacturers’ National Bank were major players in the state. Smaller players included the German National Bank, the North Ward National Bank and the Second National Bank. Newark’s leading savings banks included the old Howard Savings Institution. Seventeen newspapers were published within the city limits, including the Newark Evening News, the Newark Ledger, the New Jersey Law Journal, the Newark Daily Advertiser and the New Jersey Frei Zeitung, a German language paper. Four rail lines—the Erie, Lehigh Valley, Morris and Essex, and Pennsylvania—served the city’s business and transportation needs. The Morris Canal was still in operation, and river traffic was brisk along the Passaic. Newark was governed by a mayor and Common Council. The council met on the first and third Fridays at City Hall, then located at 873 Broad St. On Sundays and holy holidays, Newarkers worshipped in churches of many denominations. The city had 12 Baptist churches, three Congregational churches, 12 Episcopal churches, 6 Evangelical Lutheran churches, 17 Methodist churches, 18 Presbyterian churches, seven Reformed churches, 17 Roman Catholic churches and five synagogues. A check of the 1898 Newark City Directory shows dozens of social clubs and organizations such as the Phoenix, Progress, Seventeenth Ward and Woodside clubs. Other organizations included the National Turnverein, the Lincoln Club of Roseville, the Dryden Literary and Mutual Society and the Frelinghuysen Lancers Association. Secret societies also were listed in the directory’s classified section, although one wonders just how secret they were if they were listed in a public directory. They had names such as the Improved Order of Redmen, Knights of New Jersey, and the Knights and Ladies of Hara. Key city officials included Mayor James Seymour; E.L. Price, council president; Frederick T. Johnson, city attorney, Isaac R. Denham, treasurer, and Lewis J. Wendell, city clerk. Across town at the county court house, Henry M. Doremus held the post of sheriff and Thomas McGowan was president of the Essex County freeholders, who met the second Thursday of each month. The freeholders established many committees, including one for the county Asylum for the Insane and the Essex County Park Commission. Federal business was transacted at the U.S. Customs House at Broad and Academy streets between 9 a.m. and 4 p.m. Newark was then in New Jersey’s Sixth Congressional District. The nation’s population was approximately 74 million people. History lists many important happenings in 1898. George Gershwin was born in the United States. Turkey evacuated Crete. Empress Elizabeth of Austria was assassinated in Geneva. Zola published his most famous work. Diesel motors came into use. Zeppelin invented his airship. The Chinese dowager empress assumed supreme power in her country. The Irish Local Government Act was passed. The British prime minister suggested an Anglo-German alliance. And the War Revenue Act was passed by Congress and signed. William McKinley was president. Foster Voorhees was governor, and James Seymour was Newark’s mayor. The stage was set for Newarkers and Jerseyans alike to march off to war, and march they did! Next Thursday we will take a look at the reasons for the war and more closely examine the role played by the soldiers from Newark.